When thinking about Seb’s 2nd birthday party this weekend you can’t help but think back to birthday parties you celebrated when you were younger. As my birthday falls at the beginning of July it often meant that my birthday party coincided with the end of term and of course the start of the much anticipated summer holidays. I was lucky enough to grow up in a beautiful house in Northaw that had the most awesome garden. Loads of space to run around and more importantly, space to play a proper game of rounders – my favourite sport at school. Most of my birthdays revolved around games of rounders in the garden, parties in the sunshine and amazing birthday cakes courtesy of my Mum. A very early memory I have is of dressing up as Rainbow Bright, my obsession as a young girl and my Nanny had made me THE most amazing rainbow bright outfit to wear and Mum had surpassed herself with a fabulous Rainbow Bright birthday cake. Now I’m absolutely positive there is photo evidence of this Rainbow Bright outfit which unfortunately didn’t survive very long as our dog Barnaby also took a shining to it and decided to have it for afternoon tea. Staples of birthday parties in those days were party ring biscuits, finger sandwiches, iced gems, cupcakes and rice crispy cakes. 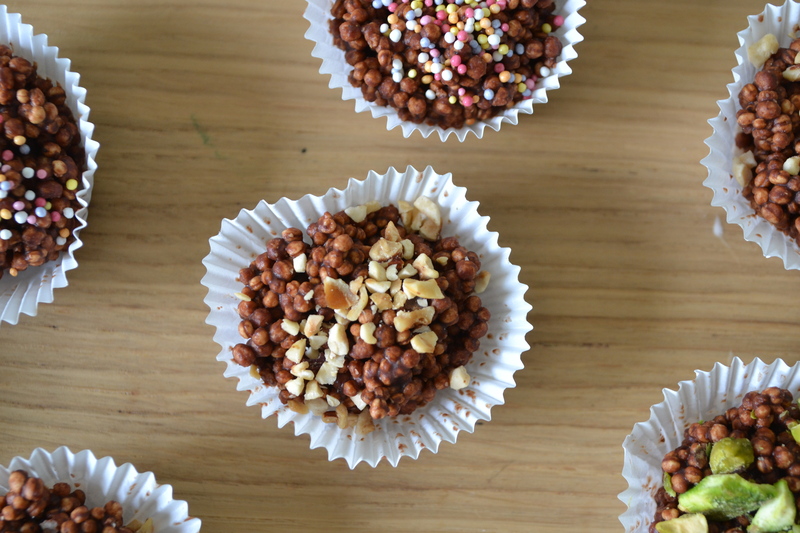 I remember making rice crispy cakes with plenty of melted dairy milk, lashings of rice crispies dolloped into cup cake cases and left to set in the fridge whilst I licked the chocolate off the spoon. 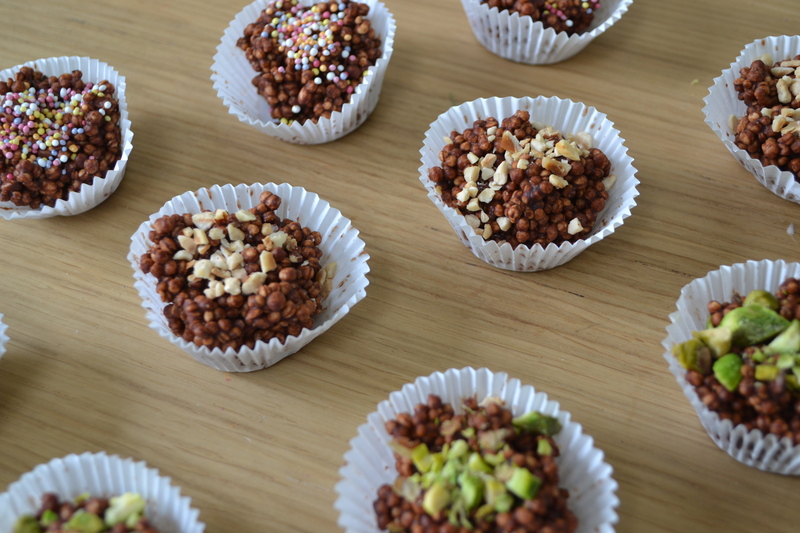 I wanted to take a stab at making those rice crispy cakes but using slightly less sugar fuelled ingredients. 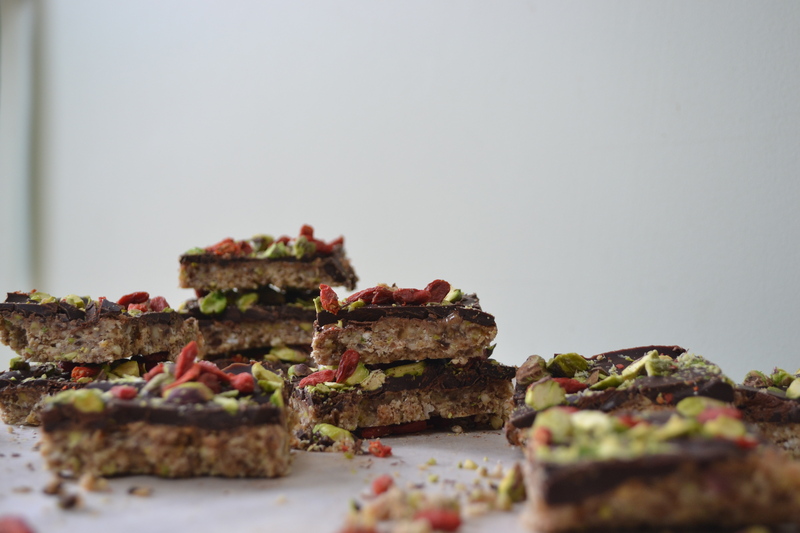 Quinoa puffs have been popping up on my feed on instagram more and more frequently either used as part of a smoothie bowl for breakfast or as an ingredient in ‘raw’ chocolate bars. Flicking through ‘Deliciously Ella’s’ cookbook I spotted she had made quinoa and cocoa crispy treats and they looked super simple to conjure up on a Sunday afternoon. I used her recipe as the basis of my mini quinoa chocolate puffs but used a lot less raw cocoa as I think it is so rich anyway you can get away with using less, plus I wanted Seb to enjoy them and I thought it might be a bit too bitter for him. I also made the addition of adding a few different toppings, which you can sub for other nuts or just leave them plain. 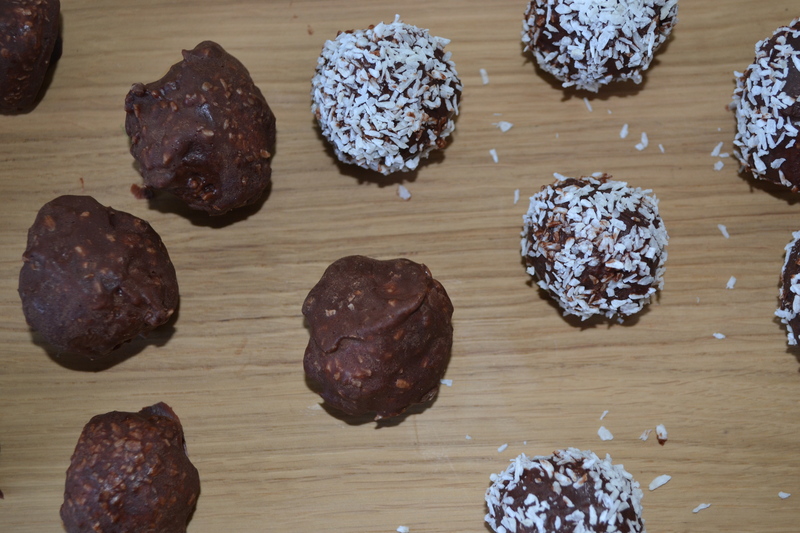 These are great bite size snacks that can be eaten straight from the freezer as a little treat after dinner, but without the sugar rush of rice crispy cakes. I don’t think you get quite the same ‘crunch’ of a rice crispy cake but actually that made them easier for Seb to munch through and it’s not something I missed. The pure chocolate taste of raw cocoa is so delicious and I liked the element of the different nut toppings to add another flavor. Seb unsurprisingly always went for the ones topped with the rainbow of sprinkles… I think Rainbow Bright would have approved. Toppings of your choice, I used chopped pistachios, chopped hazelnuts and rainbow sprinkles. Place your coconut oil in a bowl over a saucepan filled with water that is simmering. Once melted add your cocoa powder, maple syrup and peanut butter and mix well to combine. 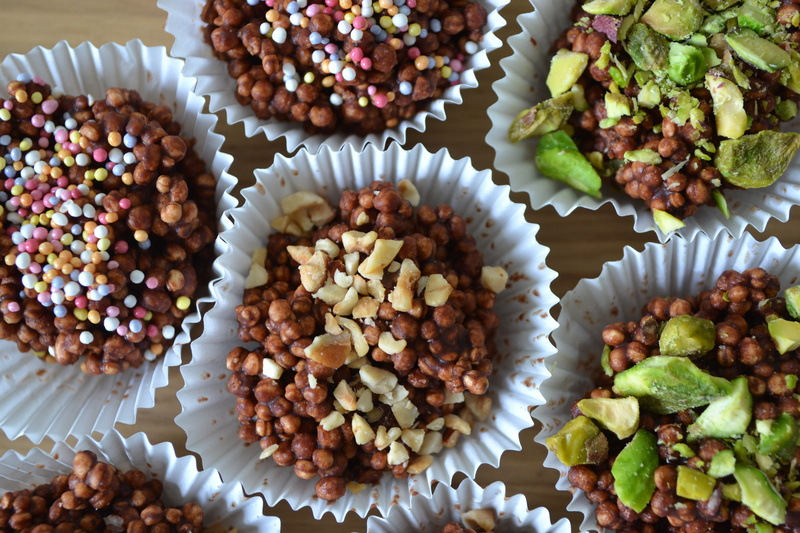 Once it’s combined, take off the heat and add your quinoa puffs and mix thoroughly so that your quinoa puffs are covered thoroughly with the chocolate mixture. Spoon the quinoa puffs into your cup cases and sprinkle on your toppings before placing in the freezer to harden. These will last in the freezer in an airtight container for about a month. Finally summer feels like its on the way and with a heat wave hitting the UK over the past week (although it is currently pouring down as I type this), I feel like the summer wardrobe is here to stay. We got the BBQ out last weekend, two nights running and it was lovely to sit outside in the garden into the evening sipping on a glass of wine whilst devouring homemade burgers one night and chicken kebabs the other. We enjoyed lunches by the river in the baking sunshine and followed them up with plenty of ice cream. Seb couldn’t believe his luck as he tucked into his first bowl of chocolate ice cream. We’ve got a busy few weekends coming up and the all important job of moving Seb into his new ‘big boy’ bedroom decorated with plenty of dinosaurs and (unintentionally) glow-in-the-dark dinosaur curtains that I’m hoping don’t scare the life out of him on his first night in his new room. He seemed suitably impressed the first time he wandered up there to see what we’d been up to and let out a loud ‘wow!’ which made all the hard work worthwhile. We’re celebrating Seb’s birthday (a week early) with a BBQ, Beers and Brownies 2nd birthday party at home with some friends and grandparents. I still need to get my head round how I’m going to make a train cake for him and have spent far too long looking at train cakes that I wake up in a cold sweat at night having nightmares about producing one! As I’ve said before, my artistic skills are clearly lacking and my dislike for all things fondant mean I better improve my buttercream piping skills sharpish. More on how that goes another time though. With the sunny weather forecast again, this should really be a recipe about ice cream, but I’ve not quite got round to making another batch just yet, although I have my eye on a few different flavor combinations to try. Instead (I’m sorry) this is another breakfast recipe… I really am obsessed by breakfast clearly. So much so in fact, I couldn’t just pick one recipe this time and instead am providing with you two flavor combinations to try. The first recipe, ‘Peanut butter and banana’ evolved because to be honest, I just love peanut butter. Give me a teaspoon, hell give me a tablespoon and a tub of it and I’m happy. Peanut butter and banana is a tried and tested flavor combination that you just know is going to start you off on the right foot in the morning. You don’t need to add any extra sweetness in terms of honey or syrup because the ripe banana does all that work for you. 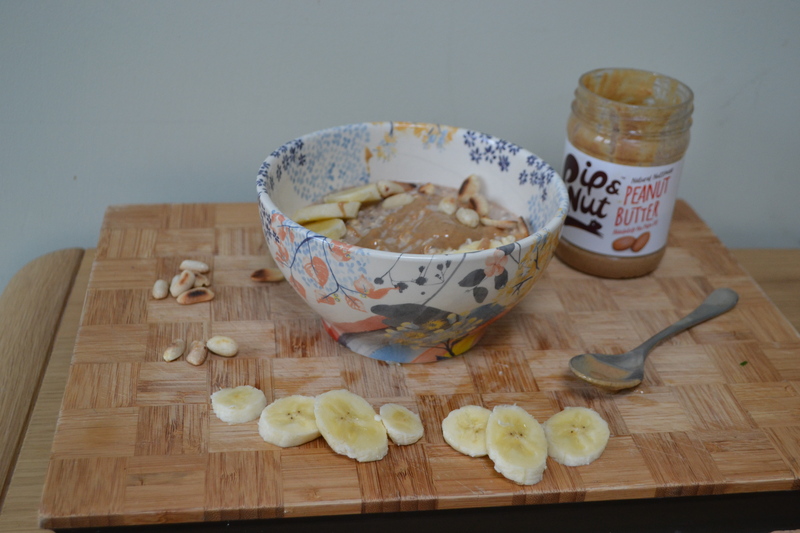 And well, I don’t need to tell you how great peanut butter tastes, but it also provides a bucket load of good fats and protein, which will keep you going all morning. 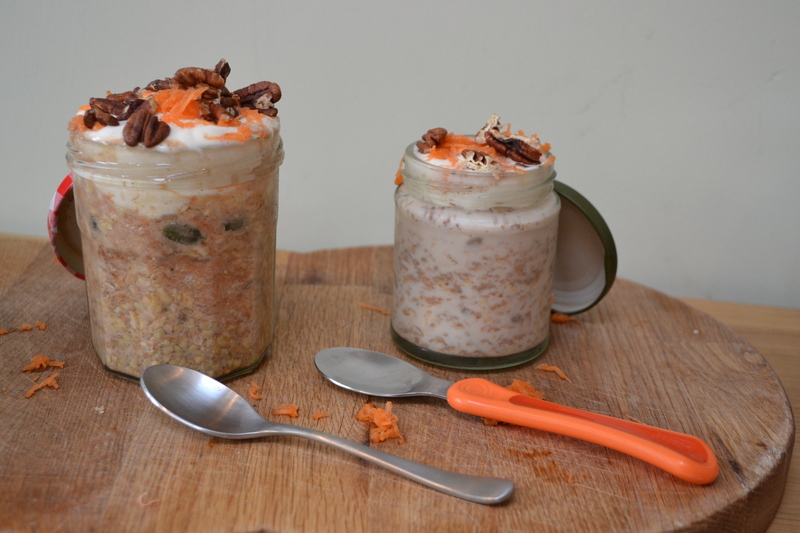 The second recipe, ‘Carrot Cake’, was conceptualized because I’d seen lots of people adding grated courgette to their porridge (which they call zoats) and I wondered how that might work with finely grated carrot. This is a step forward for me as carrots really are one of the few vegetables I can just about tolerate now but still won’t choose, but I try to get Seb to eat all the time. He’s always much more keen to try new things if he sees me eating them so I made us both a batch this week for breakfast before we hit swimming lessons (for him) and the gym (for me.). The cinnamon and ginger spices conjure up those flavours you’re familiar with from a traditional carrot cake and I think the coconut yoghurt brings a lovely indulgent creamy sweetness. You can of course sub this for Greek yoghurt if you’re really not a fan of coconut yoghurt, but I really think it’s worth a try in this instance. 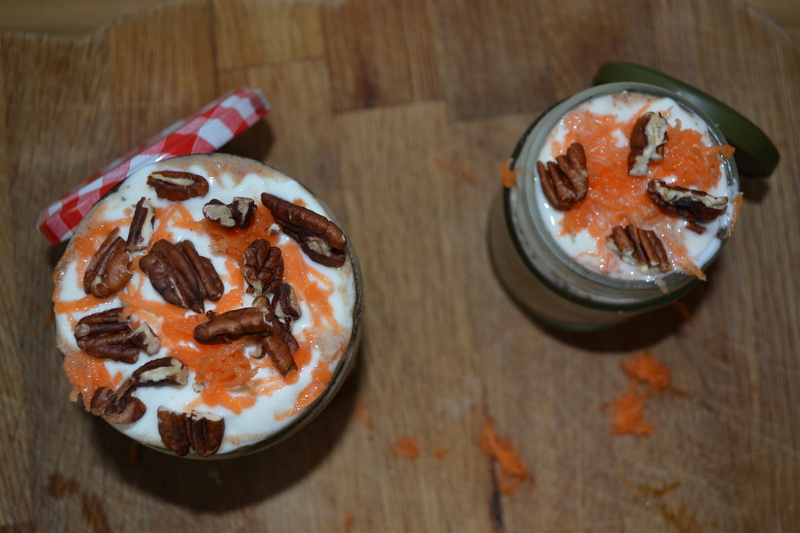 The toasted pecans on top give a much needed crunch and bite against those soft plump oats and If you shut your eyes I think you can almost be fooled into thinking you’re having some freshly baked carrot cake. Two recipes, both can be prepared the night before and toppings added in the morning so that you can take it for an on the go breakfast, but best enjoyed with a coffee in the garden with a newspaper and plenty of sunshine. Place your oats, chai seeds, ground cinnamon, vanilla extract, peanut butter and milk in an airtight container / jar and mix. 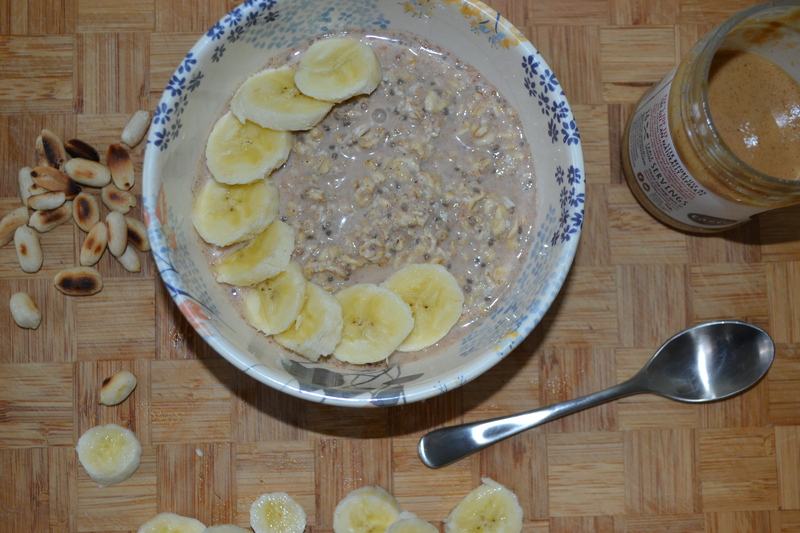 In the morning, mash half of your banana and mix through your oat mixture. To serve, place your chai-oats in a bowl or jar and top with sliced banana, as much extra peanut butter as you fancy and some toasted peanuts. Place your oats, buckwheat, cinnamon, nutmeg, ginger, agave nectar, grated carrot, pumpkin and sunflower seeds in an airtight container / jar followed by the milk and mix well. 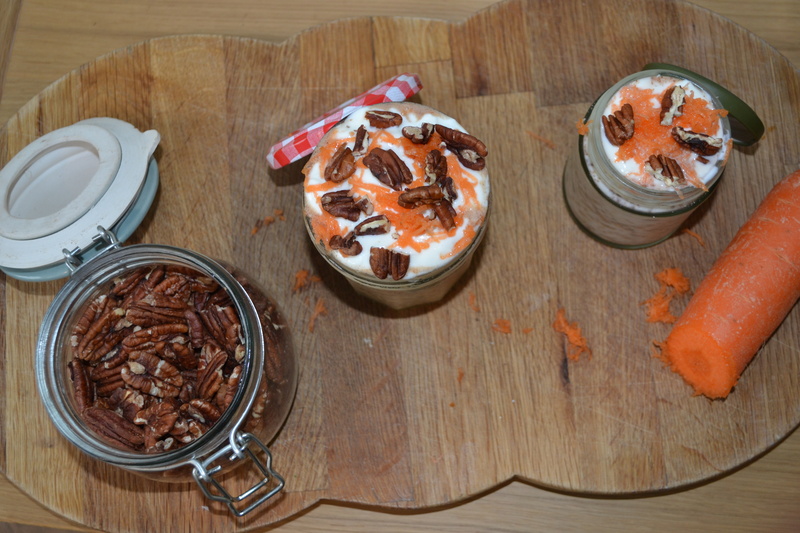 Serve topped with yoghurt, more grated carrot and toasted pecans. My younger sister Emily, has just been on the first of two hen dos, the first taking place in Bangkok as she lives in Hong Kong. The second is later in the year when she’s back in the UK in July, which I’ve had the pleasure of organising along with the other bridesmaids. By coincidence it was this time 4 years ago that I was on my hen do in London. It was the bank holiday weekend and the weather was just fabulous, much like this weekend in fact. We started with a slightly more reserved ‘Not afternoon Tea’ at the Oxo Tower with breathtaking views over the River Thames. The sun was shining, beautiful views, fantastic food and drink and more importantly all my most significant ladies around one table; it was a great start to a very fun weekend. The Prosecco was endlessly topped up, we devoured stunning desserts and everyone was in a great mood. With everyone a little tipsy by the end, we headed onto our hired apartment in South Kensington to put our party dresses on ready for an evening of dancing and singing at The Piano Bar on High Street Kensington (London’s best kept secret). It was an epic evening and the piano man, Michael Moore, did us proud with all the classics and put up with endless song requests from our table. I think towards the end of the evening he might have regretted to agree to come sing at my wedding day! Over the weekend there were dance lessons (an attempt was made to master Beyonce’s ‘single ladies’ dance) manicures and pedicures, lunches, dinners as well as a spot of dancing and I think a bottle or two of apple sours to toast our Loughborough University days might have been drunk too. It really was one of those weekends you can’t help look back on with a big smile on your face. Now I can’t spill the beans on what I have planned for Emily, but I hope she’ll look back on her UK hen do with just as big a smile. 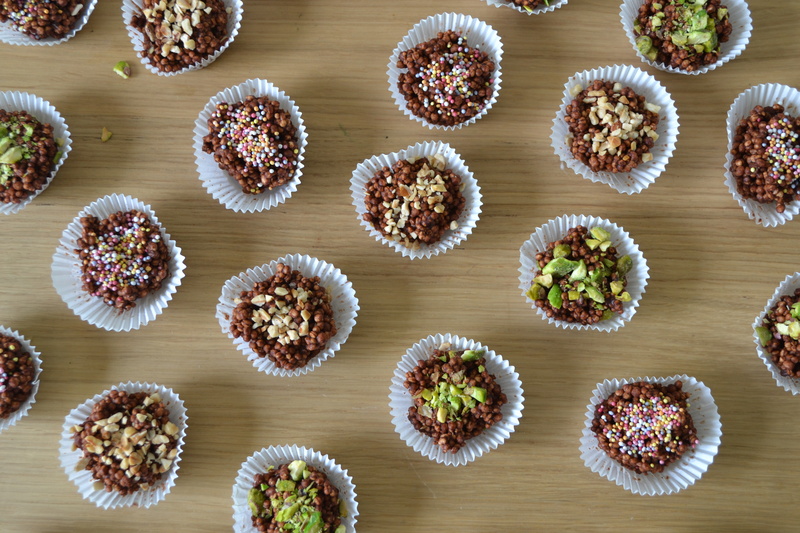 There will of course be giggles, bubbles and I’m sure some sweet treats, although more than likely with a little more sugar in them than these addictive chocolate bites. 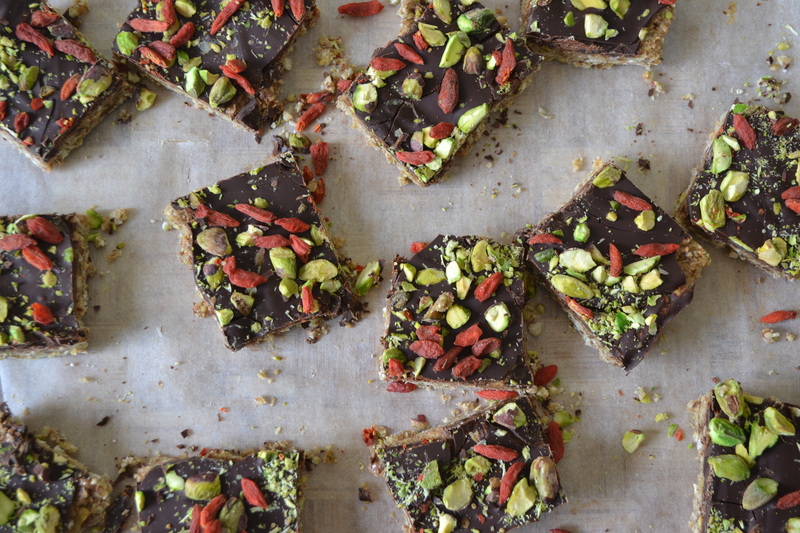 These are packed with oats, buckwheat groats and an array of nuts, topped with almond nut butter and covered with bitter dark chocolate and a final sprinkling of goji berries and pistachios. 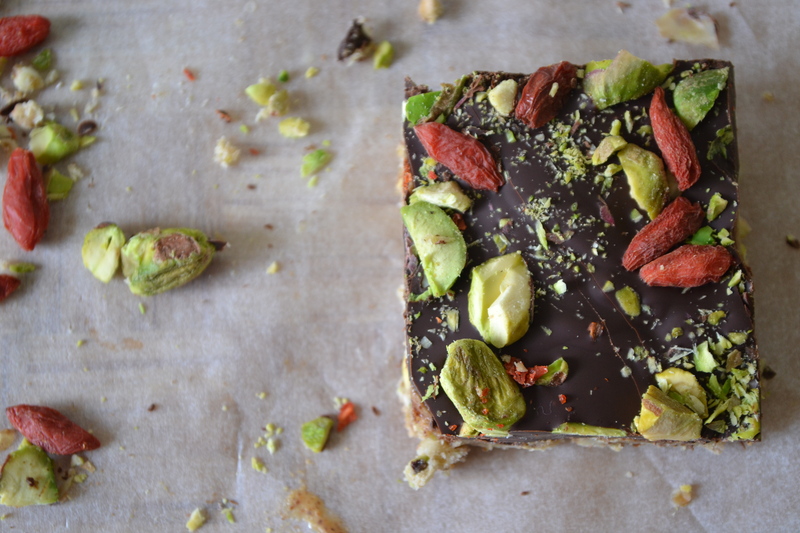 You only need a small bite to satisfy that sweet tooth but you’re getting all those good fats and protein that ought to keep you going until the next mealtime. In fact they work out as a good snack pre or post a gym workout. 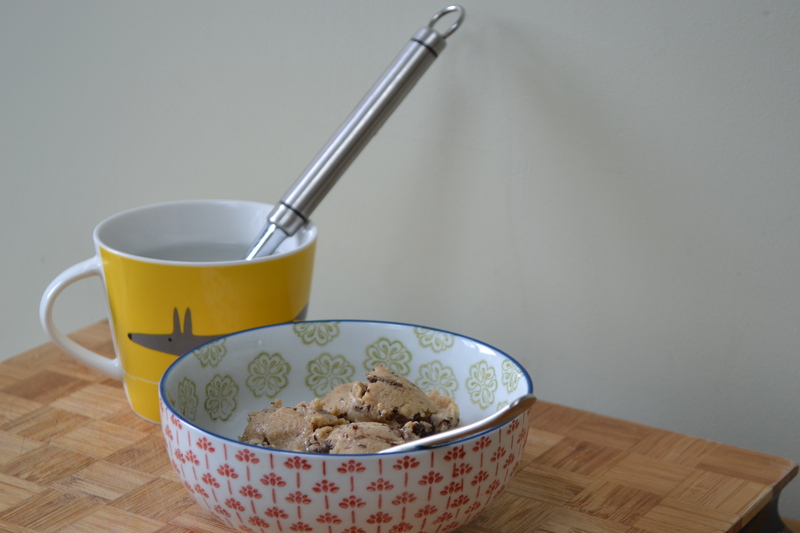 There is no baking involved, just a food processor doing most the work and a bit of elbow grease squishing it all into a tin before placing it in the freezer – couldn’t be easier really. It’s definitely a good treat to keep in the freezer when you fancy a pick me up treat without the bad stuff. Seb gave it the thumbs up too with a chocolate moustache displaying his approval. 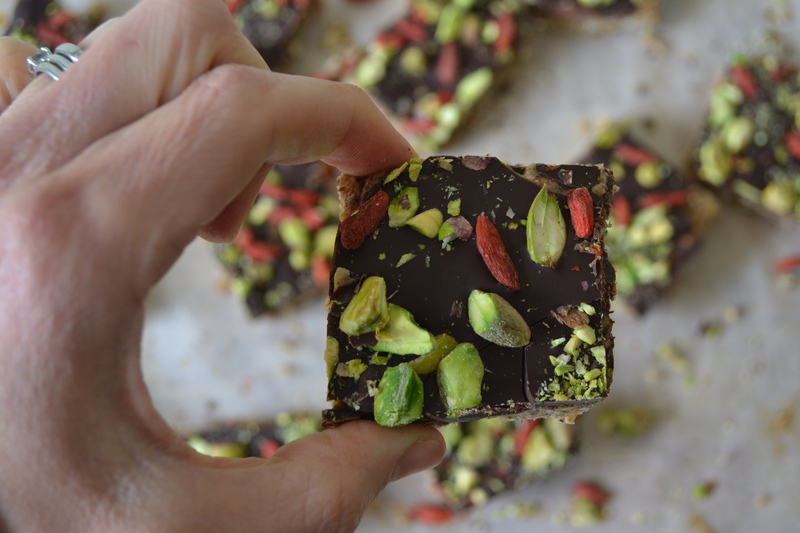 They look pretty to look at too with the gorgeous green pistachios and bright red goji berries bursting with vibrant colour against the dark chocolate topping. In fact I’d say they are just about cute enough that you could serve these up if you were hosting an afternoon tea or hen do at your house as an alternative to all the cake on offer. And I wouldn’t be surprised if people asked you for the recipe to. Best get back to scheming the hen do now… any good ideas you have please send my way. Place the oats, nuts and buckwheat groats in a food processor and blend to make a rough consistency – you still want some bite and crunch rather than a flour so it won’t take long. Add half the oil and half the dates and blend again. Repeat with the remaining dates and oil. Add your nut butter and blend. Spoon out your base into a lined baking tin (line the sides as well as the bottom to make removal easier at the end) about 20cm by 24cm in size and push down using the back of a spoon to make a flat even layer in your tin. Place in the freezer for 10 minutes to harden up. 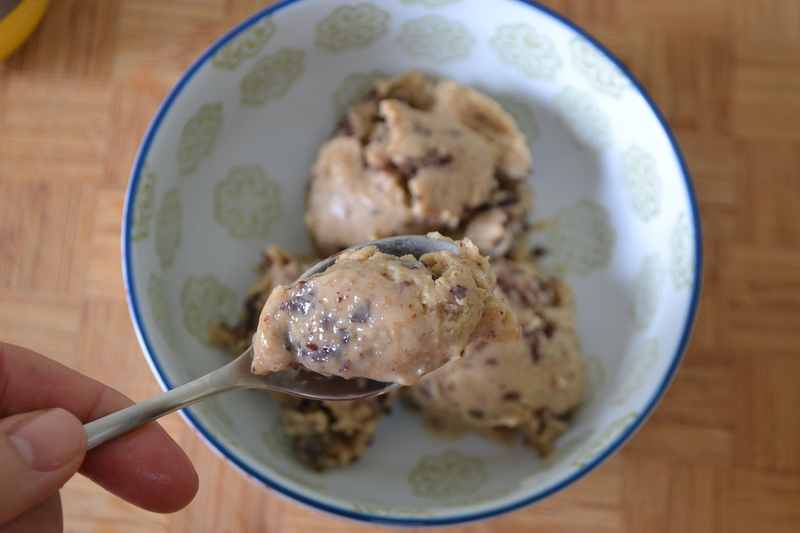 Once your base is cool and hard, spoon on a thin layer of nut butter over the base. Place back in the freezer for 10 minutes to harden up. Melt your chocolate in the microwave in a bowl – 30 seconds at a time and then give a stir until you have a smooth chocolate. If you prefer you can melt your chocolate in a bowl over a saucepan of simmering water – just make sure the bowl doesn’t touch the water or you’ll burn the chocolate. Pour your chocolate over your nut butter layer to make an even layer and quickly sprinkle your topping on before it hardens so that it sticks to the chocolate. Place back in the freezer to harden for another 15-20 minutes before cutting into squares. You can keep the chocolate bites in an airtight container in the fridge (for a week to 10 days) or freezer (for up to a month). If you’ve stored them in the freezer, make sure you take out a square about 30 minutes before you’d like to eat one so that they soften a little. Last weekend Seb achieved another ‘first’ – he finally had enough hair to warrant his first haircut. It’s only taken a month short of 2 years to have enough hair to make it worthwhile, but he got there in the end. We took him along to Trotters in Chiswick where they had a large fish tank for him to look at and plenty of books to keep him occupied just long enough for the hairdresser to cut his hair. Seb kept remarkably still the entire time (for once! ), maybe it was the sharp scissors round his ears that encouraged him not to move a muscle. 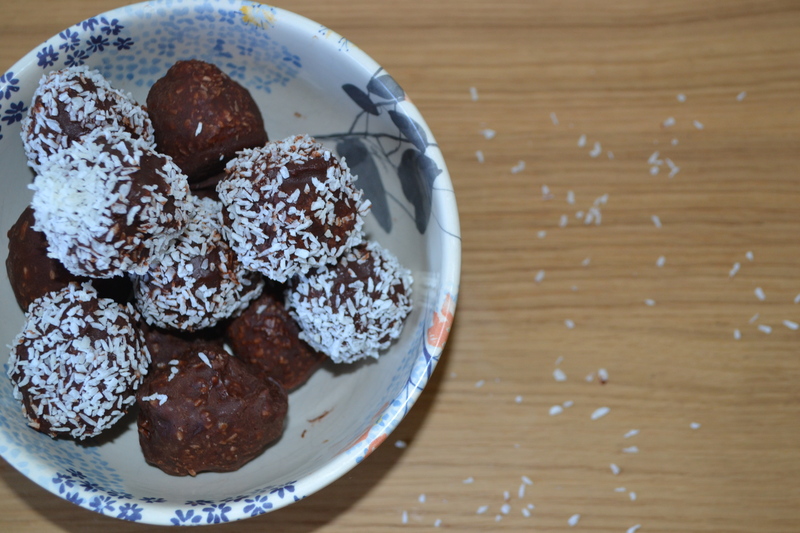 The other ‘first’ was making these flavor-full raw coconut bounty balls. I’ve tried them in health food cafes and thought they couldn’t be overly difficult to make at home when you think about the ingredients that are involved. In fact, there are only 4 ingredients in total that you need to make them so you don’t need to go out with a long shopping list either. I can imagine this is the sort of snack that is going to split the audience like marmite does… you’ll either love it or hate it. I obviously fall into the love it category and Will falls into the ‘don’t even think about asking me to try one’ camp. I was never a fan of Bountys though, so don’t let the name put you off. When a box of Celebration chocolates comes out at Christmas, there is still no way I’m going to pick out a Bounty (those are left for Mum – being the only one who likes them). Surely everyone just goes for the Maltesers which are far superior to any of the other chocolates in the box. But whilst these are obviously reminiscent of a Bounty chocolate, these are far superior in all forms. The texture is more luxurious, the chocolate is richer, the coconut more pronounced but in a really beautifully natural way. If it was a competition between Maltesers and these – well that would be a harder pick. 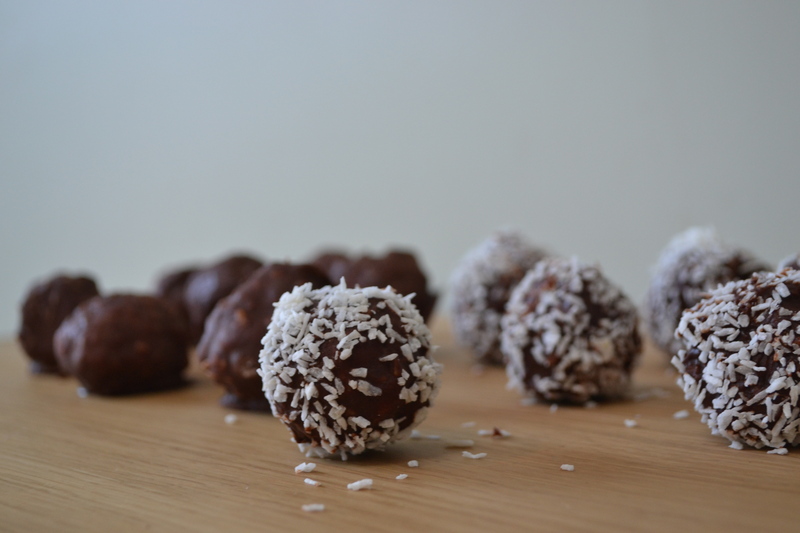 They are packed full of goodness, taste like a real chocolate treat and I think you’ll love them. Mix your ingredients in a food processor until it starts to come together a little. Add a little more oil if you don’t feel it is and place in the fridge for 5 minutes to harden up a little – this will make it easier to make the balls. 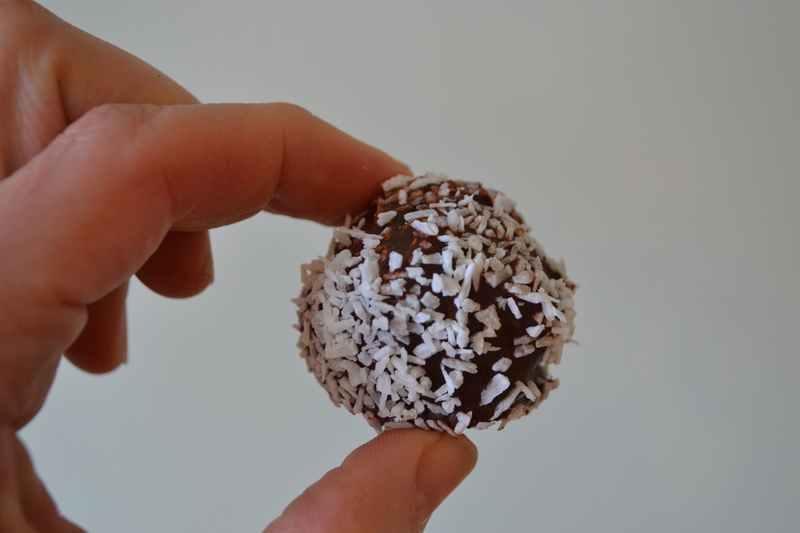 Remove from the fridge and make round balls from your mixture – you’re aiming for a bit smaller than a table tennis ball but don’t worry too much! 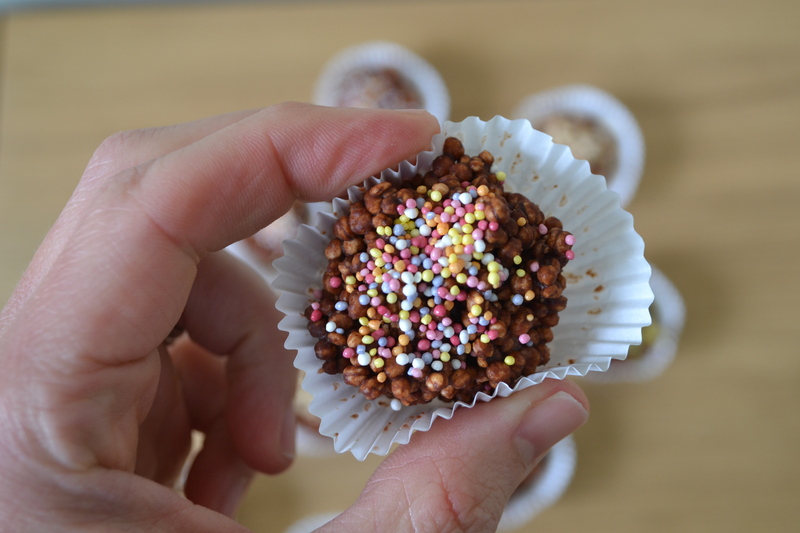 Place the balls back in the fridge for a few minutes whilst you make your chocolate coating. Place all your ingredients in a saucepan and mix together, remove from the heat. Remove your balls from the fridge and coat them with chocolate before placing them on baking paper to harden up in the fridge again. I repeated this process a few times so that I got a thicker layer of chocolate on the balls. 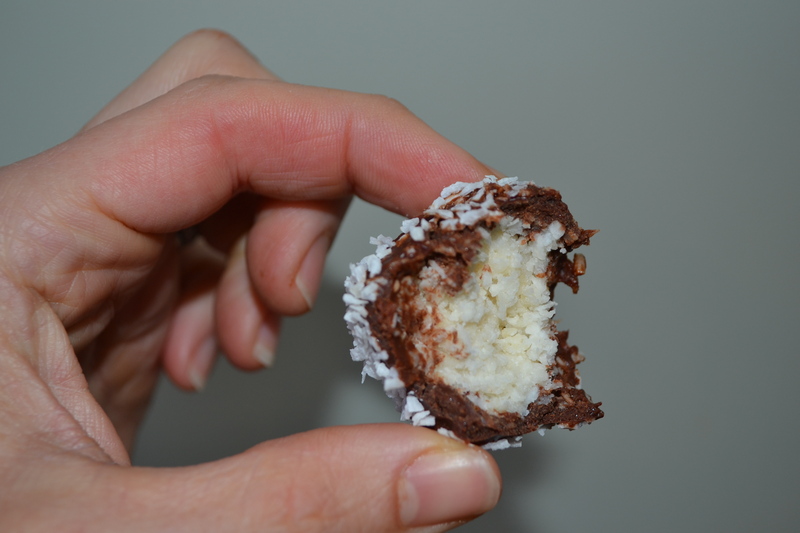 On the final layer of chocolate sprinkle on some extra dessicated coconut if you like. For as long as I can remember all I wanted to be was a tennis player when I grew up. Maybe it was being born on Wimbledon Women’s Finals Day or maybe it was hours spent at Broxbourne Tennis Club in Hertfordshire where both my elder brothers played regularly. I imagine it was the natural progression that I would also pick up a racket but who knew the bug to play would be quite so powerful. I have many happy memories of time spent at that tennis club although oddly the ones that really stand out aren’t of being on the tennis court but are in fact of feeding the ducks by the stream and collecting conkers in the fields that surrounded the courts. Each time I take Seb to feed the ducks at Barnes pond it really reminds me of my childhood. Whilst I had a crack at tennis, it was unfortunately not to be and new dreams had to be created. It could be said I’ve flitted a little bit since leaving university and whilst I’ve had some success with producing some pretty memorable events, I can’t quite help get past the dream of having a local coffee shop in Barnes. In my mind I can see the big glass front looking so inviting with beautiful treats in the window making you stop to take a second glance before the inevitable happens and you walk through the front door. There will be cool tiling on the walls and a counter adorned with the colours of the rainbow but not using paints, instead bowls of heaving salads that leave you salivating. There will be juices and smoothies to wash it all down and of course a stunning coffee machine serving the most fabulous freshly ground coffee under the advice of a great friend who knows her coffee. In fact she knows her coffee so well she’s started up her own coffee business called Bell and Rigg making beautiful coffee accessible to all. Take a look! It’s all there in my mind and one day, I’d love to make it happen. And in the mean time, I’ll continue to try out beautiful salads and experiment with different smoothie flavours that I think might just make it up on that menu one day. Often smoothies have banana added because of its smooth texture and sweetness, but there are other fruits like avocado that can also achieve this. (Yes, avocado is a fruit and not a vegetable! I fancied a chocolate mint combo but in a form that was fresh, filling and delivered a smack of flavor and I like to think I achieved it with this. The avocado produced a filling smooth texture and a bucket load of good fats. The raw cocoa provided that rich chocolate flavor without it being sickly sweet. And the mint give a real freshness against the raw chocolate that meant you couldn’t help but taking another sip. 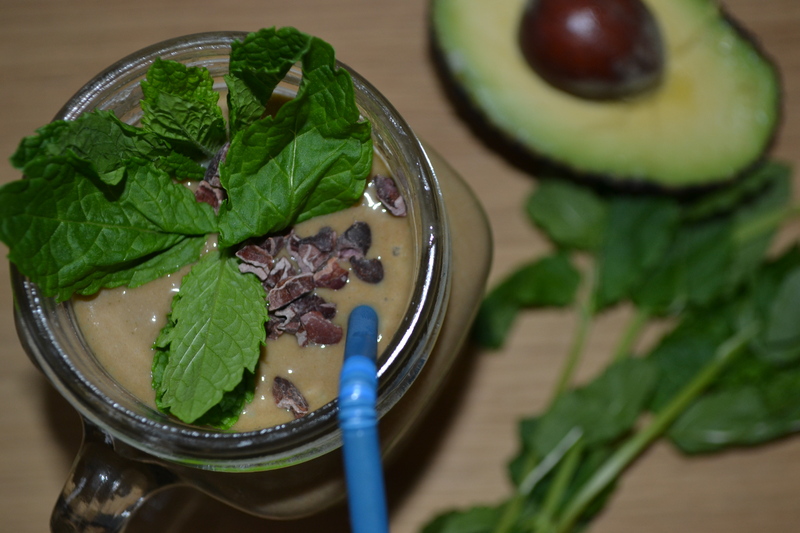 It’s simple, it’s addictive, it’s a mint aero in a jar. 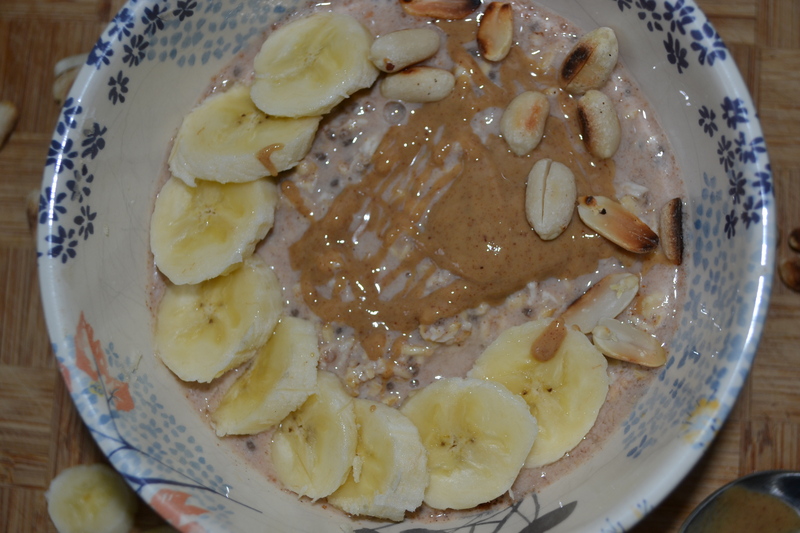 You could easily turn this into a smoothie bowl by adding a little less milk and topping with whatever you fancy. I imagine some crunch granola and coconut chips with some fresh raspberries would be delicious. 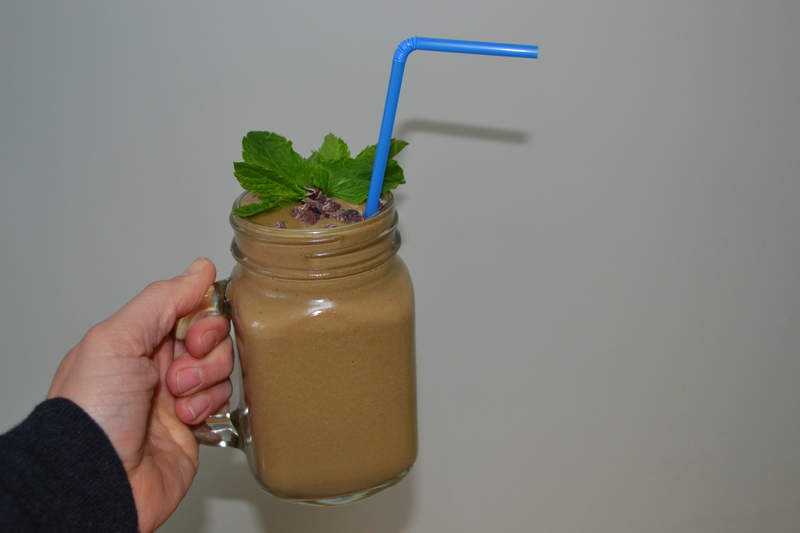 Put all your ingredients in a blender and blend! When we went on holiday, we unfortunately had a couple of hours delay at the airport which resulted in us not arriving at our villa until about 10pm. This meant Will had to nip out to the local supermarket that evening to get a few essentials for breakfast the next morning. Seb’s morning breakfast essentials include milk, eggs, yoghurt, bananas, toast and butter (we took a jar of his much loved marmite with us). For me it was yoghurt, strawberries and granola and for Will it was Frosties! Frosties, seriously?! It really made me laugh that he reverted back to his 10-year-old self and picked a children’s cereal as his preferred breakfast option for the week. It took me back thinking about the cereals we used to eat when we were little like Rice Krispies, Honey Monster Sugar Puffs, Coco Pops and of course Frosties. When I was a little older I graduated onto Crunchy Nut Cornflakes and Special K, but nothing of course beat the sugary laden cereal we were all brought up on. Of course back then parents were being led to believe they were providing a fortified breakfast for their children, totally unaware of the endless teaspoons of sugar that was being added. Do you remember Pop Tarts too? I used to LOVE those. The only problem of course is that you were toasting jam, which meant EVERY single time you burnt your mouth down to the core. Never did I learn the lesson of waiting long enough to prevent it happening. Today of course we know only too well how much sugar is in cereal and actually it’s probably one of the worst things you can feed your kids to start the day. The same goes with most granolas on the market, where sugar is added to sweeten it and to create those clusters of oats that you always search for in the packet. 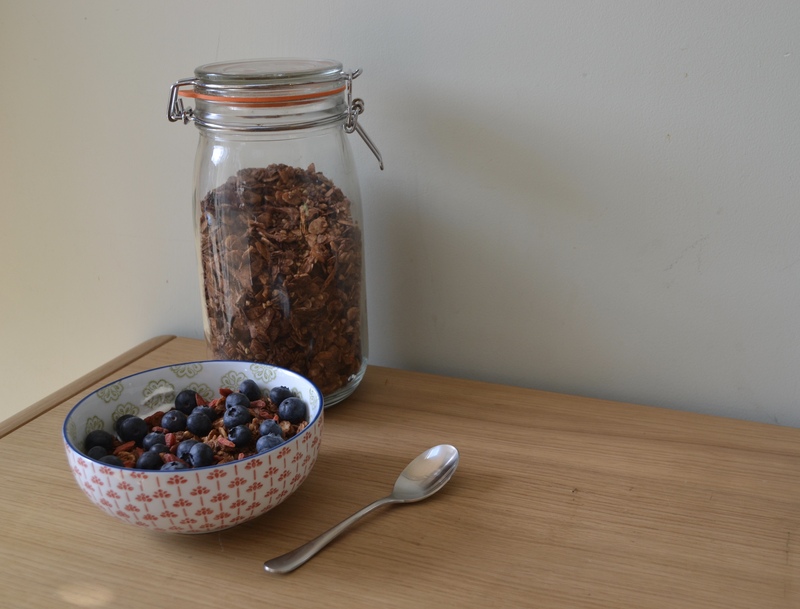 From doing some research, Rude Health is producing probably the healthiest off the shelf granola with no added refined sugar but it obviously comes at a price. Seb oddly doesn’t like any cereal at all. He likes his overnight oats soaked in yoghurt or almond / coconut milk, and he likes Rude Health coconut & chai granola on Greek yoghurt but that’s really about it. He’d rather have some scrambled eggs, pancakes or toast, which is just fine with me. I, however, love granola and as I said Rude Health is quite pricey when it’s honestly one of the easiest things to make at home. Plus, when you make it yourself, you realise you can add pretty much whatever you fancy to it. 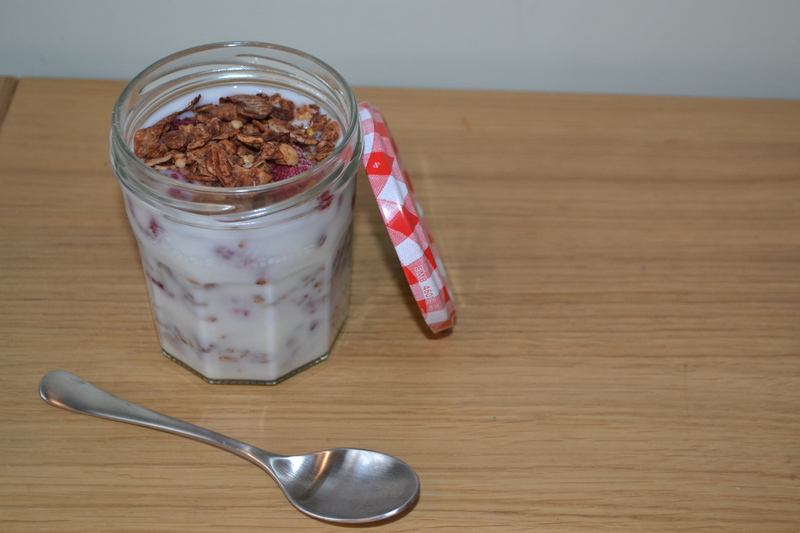 I’ve never added any cocoa to my granola before, but when I was thinking about those Coco Pops and how they turned the milk all chocolatey, I thought I’d see if I could recreate it but in a healthy version. Raw Cocoa Powder is a super powder! It’s pure cocoa before the nutrients have been destroyed by the heating process used to produce cocoa (found in conventional drinking chocolates or chocolate bars). It’s jam packed with magnesium, iron and calcium and plenty of other vitamins too. It’s slightly more bitter than the dark chocolate you might be used to so you only need a small amount and it really goes a long way in terms of flavour. 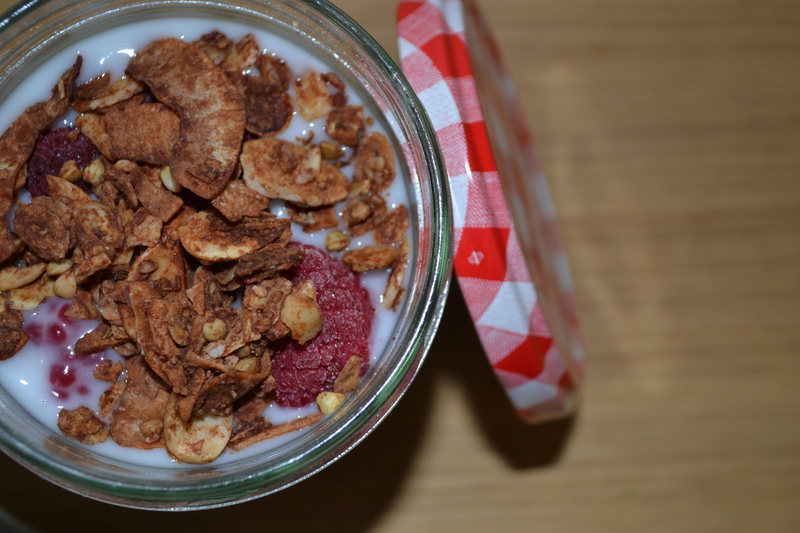 I alternated layers of frozen raspberries and granola and topped it with almond milk. 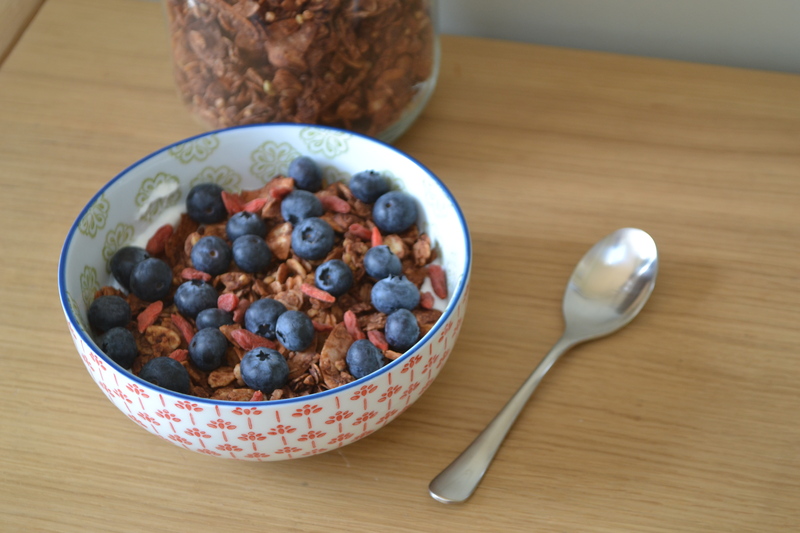 This turned the milk that lovely chocolatey flavour too… this is what I like to think of as your healthy version of coco pops. 170g of Total 0% Greek Yoghurt topped with Cocoa-Coconut Granola, Goji berries, blueberries and a drizzle of maple syrup. 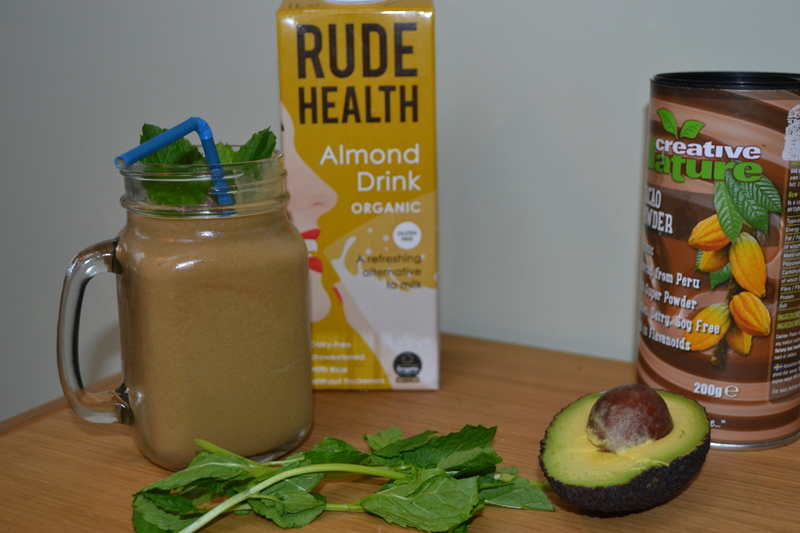 This is delicious on a warm day and is full of protein and good fats. A great way to start the day. 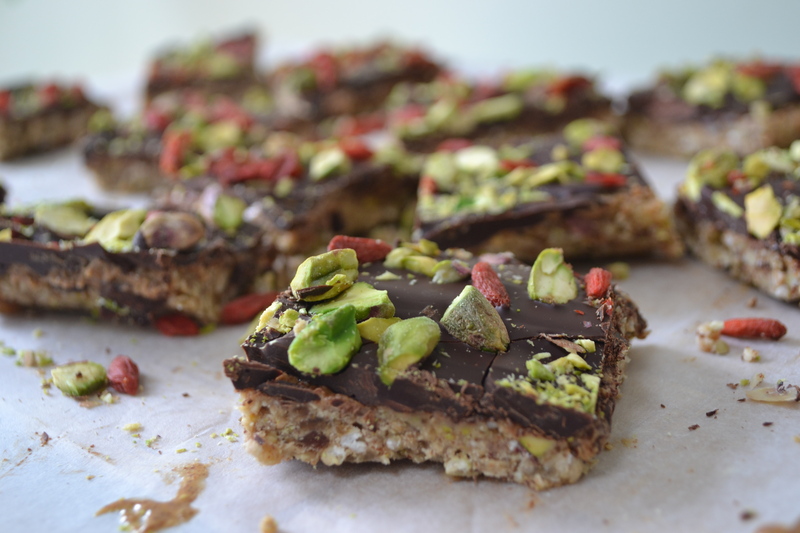 The options really are endless, I plan on adding it to the top of some porridge this weekend to add a bit of texture and crunch to those satisfying sweet oats and it also works as a great snack on the go when you just fancy something a little bit sweet and chocolatey to nibble on. At a fraction of the price (when you make a batch like this) of your regular sugar filled cereals it’s worth a try. Plus, you get all those health benefits too, so it’s a win-win for you. Heat your oven to 170 degrees c.
Mix all your dry ingredients excluding the cocoa powder (oats, buckwheat, coconut flakes, almonds) in a large bowl. Put the agave nectar, coconut oil, cocoa powder and vanilla extract in a small saucepan over a medium heat and melt and stir to combine. Add your wet mixture to the dry ingredients and coat well so that all your dry ingredients are covered with the chocolate mixture. Place the mixture onto your baking tray and spread into an even layer. You don’t want a thick layer so if your tray isn’t very big, spread it across two trays. 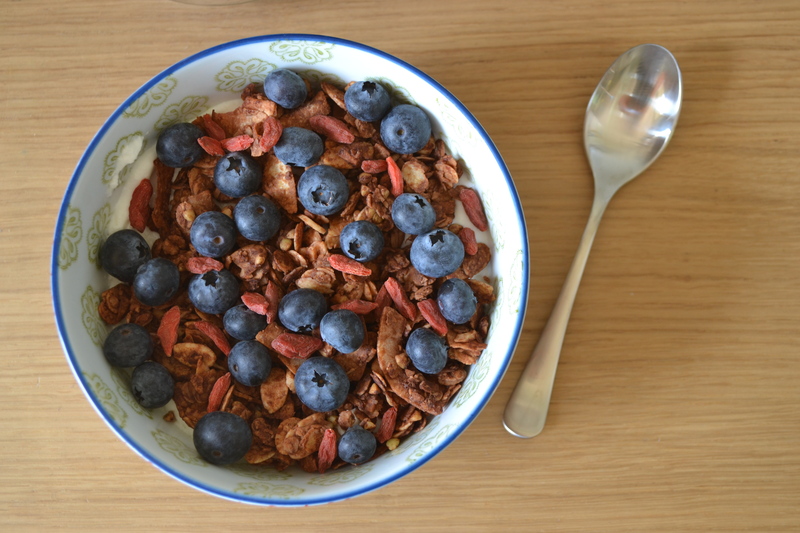 Bake for 20-25 minutes, checking every 7-8 minutes and turning the granola over so that it doesn’t burn on one side. Leave to cool in the tray before placing in an airtight container. It will last for a week – 10 days. It’s been a little quiet on the blog recently but with good reason because I disappeared off on holiday for a couple of weeks with the men in my life to spend some quality time together in Tenerife. We were all in dire need of sunshine, pool time and family time and I’m pleased to say all three were achieved. Will pulled it out the bag again and found us a fabulous villa to stay in which had everything you could desire. Since having Seb, we’ve always ventured down the villa route for our holidays. To us, it just makes sense to have the ability to put Seb down for his lunchtime nap whilst we catch some sunrays in the garden or in Will’s case disappear off to the golf course. And yes we miss going out for delicious 3 course dinners but I’d much rather have a leisurely dinner at home then get stressed trying to entertain Seb in a restaurant when he’s overtired and staying out past his bedtime. I can understand a lot of people might not like to cook dinner each evening on holiday, but to me it’s not a chore and I’d even say I miss it when I don’t get to. As long as I get out for some brunches and lunches then I’m happy enough. Little was achieved on holiday beyond a lot of chill out time at the villa. The early mornings were spent entertaining Seb whilst the sun came up (which is very late in Tenerife compared to the UK at this time of year), followed by a gym session for me at a local fitness center I found just a few minutes walk away. It could be said that I can sniff out a gym no matter where we are and Will can spot a golf course a mile off. Late morning was a trip to the local park, beach or out door soft play park before hanging out in the garden till lunchtime. Lunch took place al fresco for Seb in the sunshine and I think he lapped up having some space to run around in. Whilst Seb took a lunchtime nap, I sunbathed and Will golfed or hit the range. This was the nearest he was going to get to feeling like a professional golfer! The afternoons were a chilled out affair in the garden, swimming in the pool or playing some football before dinner and nipping out for a tub of ice cream or I’d make some homemade banana ice cream. 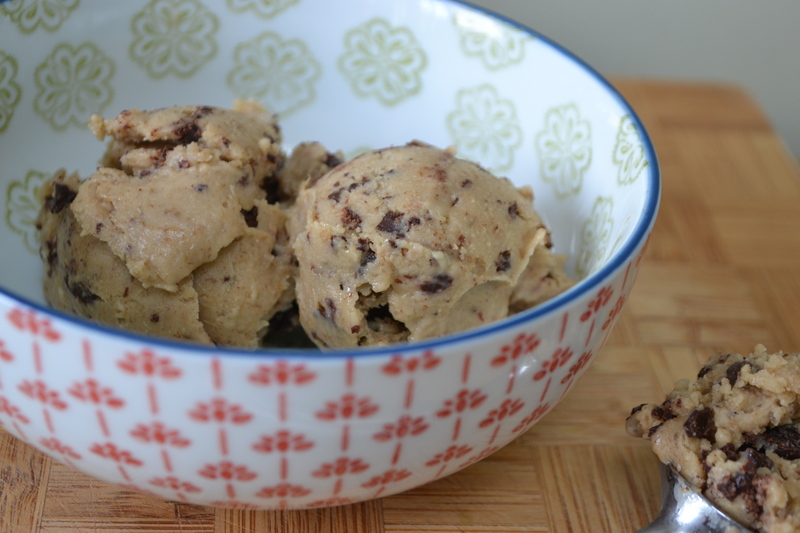 I’ve been making banana ice cream a lot for Seb as it takes minutes to whip up and you can add all sort of extras to make it even more nutritious. 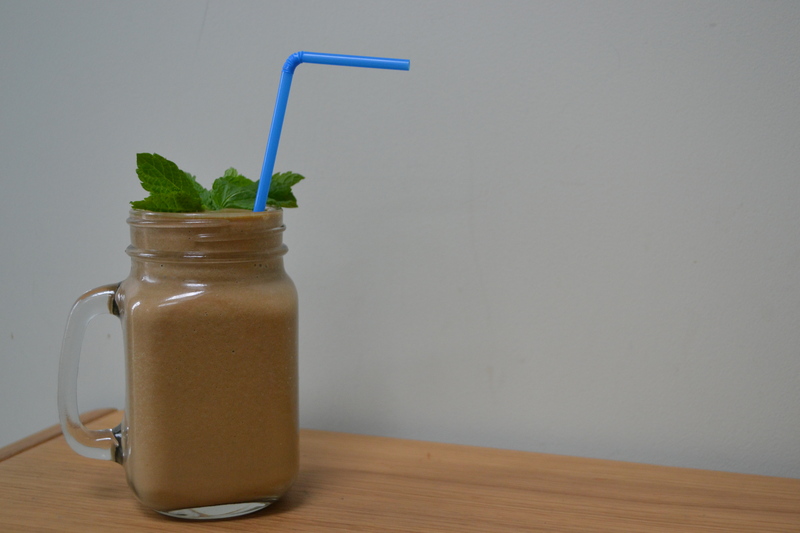 The simple version contains just three ingredients; frozen banana, whole milk and natural yoghurt, blend and serve. You can sub in crème fraiche or Greek yoghurt or add whatever extras you like in terms of fruit or nut butters. It’s pretty flexible really. What I would say is that if you refreeze it after blending it, you’ll find that it freezes very hard, so I just make enough for what I know will get eaten then. On arriving home, I was still in ice-cream making mode so whipped up some dairy-free caramelised banana and dark choc chunk ice cream. 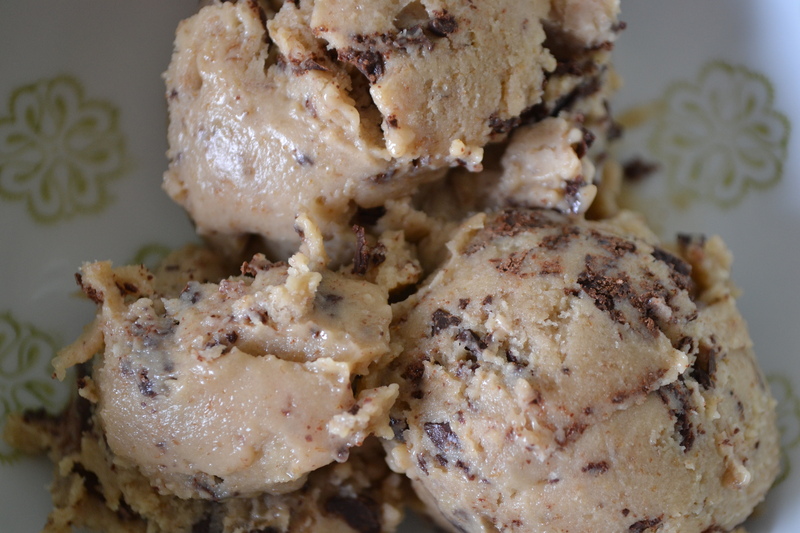 A little more fancy than what we’d been consuming on holiday, but really not overly difficult to make – admittedly an ice cream machine is pretty essential though to really make a smooth creamy soft scoop ice cream. The caramelisation of the banana makes it rich and indulgent and I found using coconut milk makes it much like a custard based ice cream. 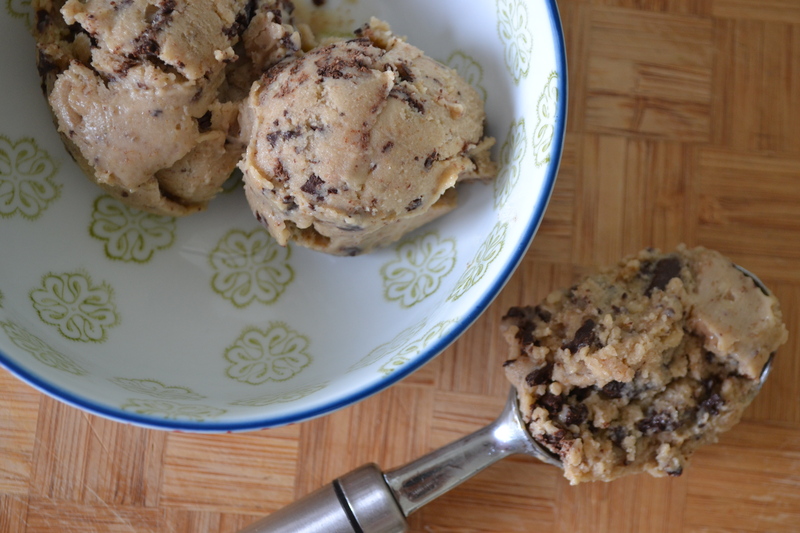 As it was Easter weekend I couldn’t help but add in the dark chocolate chunks and it really took the ice cream to the next level. Sweet caramel bananas against bitter dark chocolate, it just works. Bake your bananas in the oven for 20-30 minutes in a non-sticking baking tray sprinkled with the coconut sugar and coconut oil. Give them a toss half way through to make sure they are well coated and get an even caramelisation. Once baked and a lovely golden brown, scrape all your bananas and syrup out the pan and place in a blender or food processor. On a low heat, place your coconut milk, granulated sugar, cornstarch and salt in a saucepan. Keep stirring so that you don’t get clumps of cornstarch and continue to heat until all the cornstarch has completely dissolved and your mixture has thickened. This will take about 5-10 minutes to do. You are looking for a thick, creamy consistency. Add your vanilla extract and lemon juice once you have this consistency and mix through before pouring the creamy mixture in with your bananas in the blender. Blend your mixture until you have a smooth consistency. Chill the mixture in the fridge for a few hours or overnight before placing in your ice cream machine as per your machines instructions. Your mixture may have become a bit thicker on chilling in the fridge, feel free to whisk it a little before pouring into the ice cream machine. The coconut milk does make it thicker than regular dairy ice cream. On the last few minutes of churning when the mixture is almost firm, add in your melted chocolate. Transfer to a freezer container and place in the freezer to firm up. Leave out to soften a little before serving and add extra chunks of chocolate should you wish!